Its December 1 and that means (if you haven't already) its time to be thinking about gifts! If you have a crafter in the family (who seems to already own every major craft supply) and are wondering what to get them this year, then I might have some ideas for you! Today I gathered up 6 unique tools which would be perfect for your everyday crafter. Now the craft tools that I picked are unique because of their features and what they are essentially designed to do. These tools can also be used in a variety of craft projects which makes them nice, for that gypsy crafter, who doesn't seem to stick to one craft for very long. So for my first crafter gift guide of the season, here are 6 unique tools for your everyday crafter! 1. We R Memory Keepers 1-2-3 Punch Board: Now this punch board is amazing! I own it and absolutely love it! 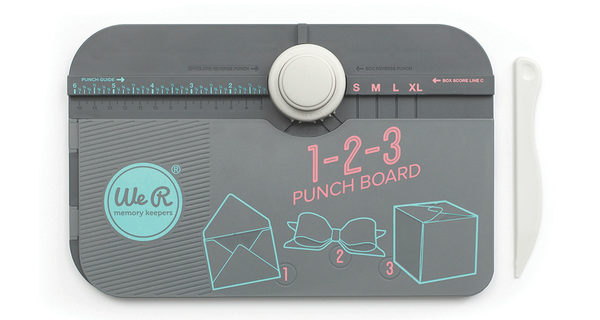 The punch board from We R Memory Keepers helps you to create your own envelopes, bows and boxes. When you buy the punch board, you will receive a score board with a 3-way punch, a scoring tool and an idea book with step by step instructions. This is a product that a crafter can use all year round and is probably something they haven't seen before! 2. Zutter Tool-it-All: This is another product that I own and absolutely love! Why? Cause its 9 tools in one! Yes, 9 tools in one! 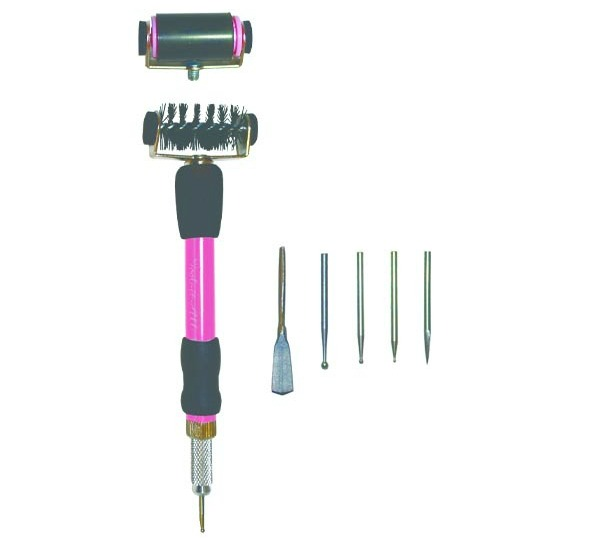 When you buy this tool, you will receive a brush, brayer roller attachment, mini spatula tip, large, medium and small embossing ball tips, flat tip piercer and sharp tip piercer. All of these pieces are interchangeable and (wait for it) can be store inside the tool's barrel! Don't believe me? Check out this video! 3. Plaid Mod Podge Mod Melter: If you have a crafter who loves hot glue guns (cough, cough) in the family, then you may want to buy them the Plaid Mod Podge Mod Melter. 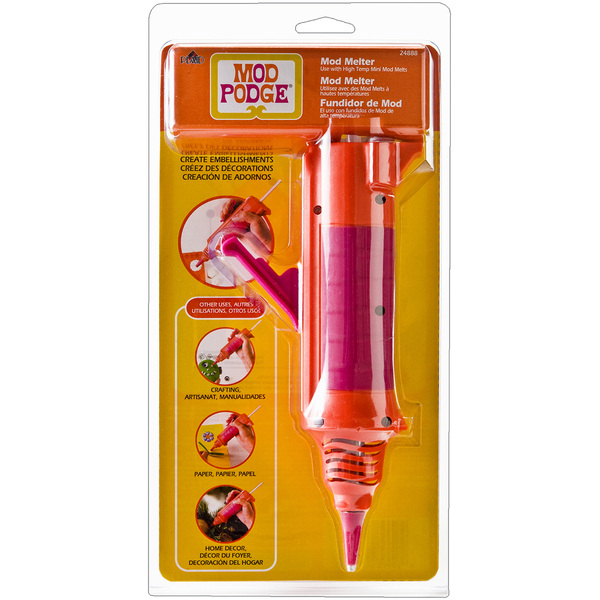 Now this tool was original designed to go with the Mod Podge Mod Molds (try saying that 5 times fast), however the tool can be used exactly like a glue gun. If you bought this, some Mod Melt Sticks and maybe a Mod Mold or Hot Glue Gun Helpers, you would be set! On a side note, I do own this product as well, and think its great for that crafter who makes a lot of home decor projects. 4. We R Memory Keepers Photo Sleeve Fuse Tool: A little while back, I was able to test out this product for CutOut & Keep. Now I'll admit that I'm not really a scrapbooker, but this fuse tool was so darn cool! The Photo Sleeve Fuse tool is designed to be used when creating scrapbooking layout and is specifically designed to help you to create custom size sleeves, add waterfall sleeves or seal in keepsakes. However, I could see it being used in other areas of crafting like home decor. When you buy the product, you will receive the fuse tool, one fusing tip, one cutting tip, one 6-1/2 inch long ruler stencil and one tool stand. 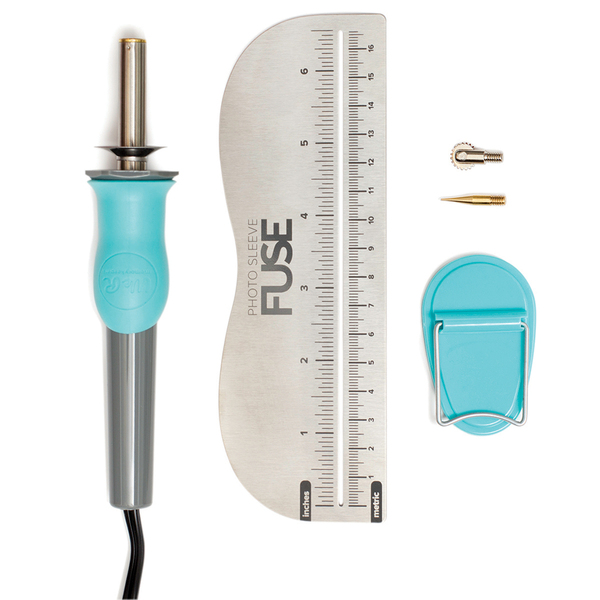 I think it's important to mention that this fuse tool comes in different ''versions''. For example you have a U.S, AU, UK and EU version. The only difference between the four is the voltage and the plug-in needed for the tool. So make sure you get the fuse tool designed for your country! 5. 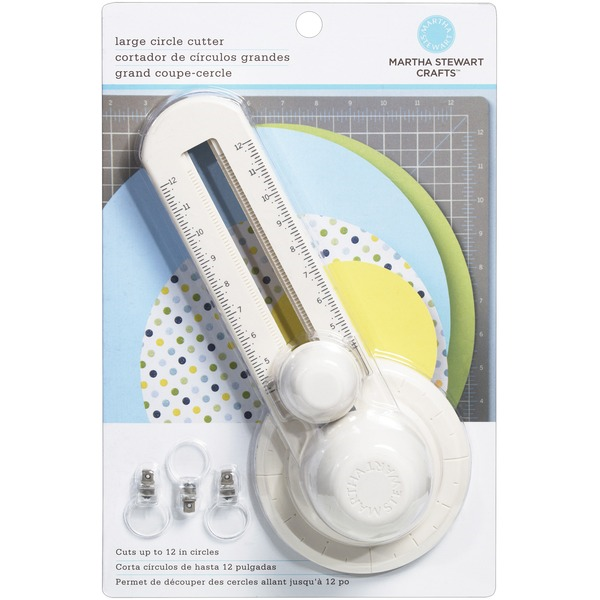 Martha Stewart Large Circle Cutter: Now you may be thinking that a circle cutter can't be unique, however this circle cutter can cut circles from 4 inches to 12 inches in diameter! It also allows you to cut both in a clockwise and counterclockwise wise motion. When purchasing the product, you will receive 1 circle cutter and three replacement blades. This would be a nice tool to add to a crafter's punch collection and could be used over and over in a ton of different craft projects! 6. 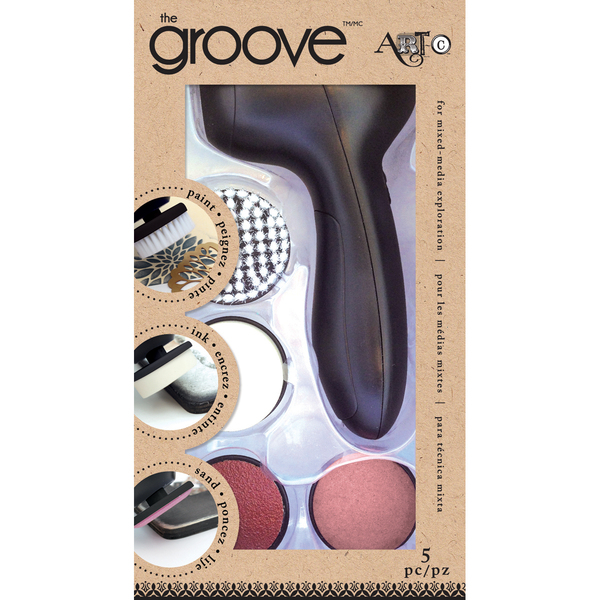 Groove Tool Starter Kit: This craft tool, is one that will be on my Christmas list! The Groove Tool Starter Kit is designed to help you create vintage and distressed effects. The tool itself has two speeds (high and low) and includes one sponge tip, one brush tip and two sanding tips. You can also buy replacement heads or additional heads for the tool as well. So what would this tool be exactly used for? Well, in a nutshell, distressing. This could be distressing fabric, wood, paper and so forth. If you know someone who loves Distress Inks by Time Holtz, then they would probably love this tool as well! There you have it folks! Those are the 6 unique tools that I think everyday crafters would love to receive as gifts, this holiday season! Now if your wondering where you can purchase these products, you can find them all at Blitsy. Right now all of these products are on sale and Blitsy has extended their Black Friday Deals for today only! So you can find these products and other products you may like! What unique crafters tool do you recommend be given as a gift this holiday season?